TOKYO, Jul 18 2013 (IPS) - Efforts to protect the critically endangered Iriomote wildcat, a spotted, shy, feral creature native to the tiny Iriomote Island that forms part of the Okinawa Prefecture in southern Japan, are becoming a highly respected model of conservation here, where the government’s uneven track record in protecting imperiled species has frustrated wildlife activists for decades. A unique collaboration between diverse stakeholders including government agencies, non-governmental organisations and local groups is helping to preserve the dwindling wildcat population, now numbering just about 100 animals, down from an estimated 300 about a decade ago, experts say. Iriomote cats have long roamed the forests on this hilly, semi-tropical island, but infrastructure development and expanding farms and sugarcane plantations have encroached on the creature’s natural habitat, while speeding cars on huge roads that now snake through their territory have resulted in untimely deaths of the protected species. The two-year-old conservation effort has made significant inroads into protecting the cats by pooling a wide range of skills, public resources and native knowledge. Specific initiatives include wildlife awareness projects targeted at the local population, comprised primarily of subsistence farming and fishing communities; the building of tunnels that serve as safe passageways for animals attempting to cross the roads; and popular tours for visitors to observe the animals in the wild. 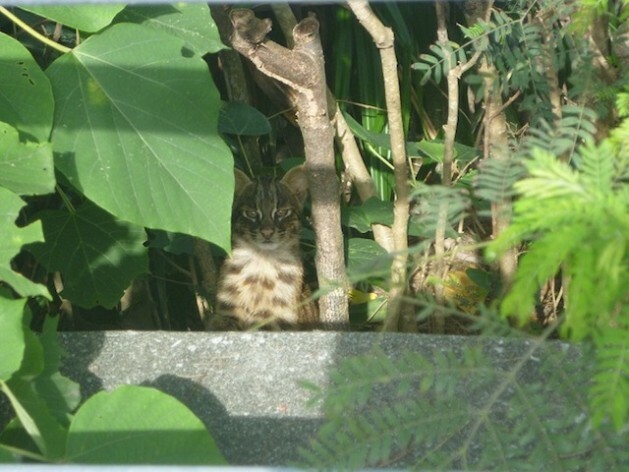 “The steady decline of Iriomote wildcat numbers is [due to] rapid economic development on the island,” explained Kumi Togawa of the Japan Tiger and Elephant Fund, an NGO that works to curb the illegal wildlife trade, and reduce domestic demand for wildlife and related products. She told IPS that recent surveys conducted among the 2,500 islanders of Iriomote indicate rising awareness and respect for conservation work. “The consensus among the people here is that if they do not protect the species that are native to their land, they will soon loose a key aspect of their cultural identity,” said Togawa. During the past two spring seasons, Murata has single-handedly rescued at least 10 kittens and moved them to safety, far away from the deadly roads. Education campaigns seeking to transform the Iriomote cat into a local icon have been particularly rewarding, as schoolchildren take on the struggle and begin to influence the adults. The Okinawan archipelago boasts a high level of biodiversity and is home to some of Japan’s rarest wildlife, which the country is finally recognising as part of its national heritage that must be protected at all costs. This past March Japan took the unprecedented step of listing the hitherto neglected Ryukyu black-breasted leaf turtle in Appendix II of the internationally binding Convention on International Trade in Endangered Species of Wild Flora and Fauna (CITES). Endemic to the Ryukyu Islands, a cluster of volcanic islands in southwest Japan, the creature was classified as a “national monument” of Japan back in the 1970s, which amounted to a nationwide ban on the sale, capture or transfer of the turtle without the explicit consent of the commissioner for cultural affairs. This did not, however, prevent foreigners from trading the animal, which has recently made appearances in mainland China, Hong Kong and on various websites online, prompting Japan to submit a proposal to CITES, the first time this nation of 127.8 million people has done so. “The proposal to list the Ryukyu black-breasted leaf turtle is a small but significant step for Japan,” said Kahori Kanari, senior programme officer with the wildlife-monitoring network TRAFFIC, who recently co-authored a report supplying evidence of the emergence of an illegal Asian trade of this species. Another positive indicator of Japan’s move towards a new conservation model is the recently unveiled National Biodiversity Strategy for 2012-2020, outlining national targets that run parallel to the Aichi Biodiversity Targets agreed upon at the October 2010 meeting of the Conference of the Parties (COP10) to the Convention on Biological Diversity, including fostering community support to protect the environment. The loss of the Japanese otter is a case in point. The animals have not been spotted in the rivers, their natural habitat, for over 10 years, resulting in the species being officially recognised as extinct in 2012. Aramaki says the primary reason is the pollution of Japanese rivers from mining and other industrial projects. She called the loss of the otter a “bitter reminder” of the need to work with local communities to find lasting protection mechanisms for endangered wildlife. While conservationists are pleased at the changes taking place, they are also painfully aware that sporadic breakthroughs do not mean they are nearing the end of their long struggle. The most recent reminder that the future of wildlife conservation is far from rosy came on Jul. 17, as public hearings at the Hague-based International Court of Justice (ICJ) drew to a close on the case between Australia and Japan, regarding the latter’s whaling practices in the Southern Ocean surrounding Antarctica. The case, filed by the Australian government last month, referred to what Japan calls “scientific whaling expeditions” during which it catches up to 1,000 minke whales per month for “research purposes”. Western animal rights groups have long been crying foul over this practice, accusing Japan of using research as a façade for commercial whaling activity. The fact that whale meat is sold on the domestic market shortly after the so-called research has been conducted bolsters these claims. Research indicates that Japan forks out 10 million dollars in subsidies for each whale hunt, a hefty sum that the government defends as not only necessary for gathering scientific data but also as an important national tradition worth preserving. Japan’s catches of Atlantic bluefin tuna, a key ingredient in many of the country’s highly prized sushi dishes, have also run into international conflict with conservationists who have lobbied hard and won conditions to control overfishing, which is resulting in depleted fish stocks. Bluefin populations have dwindled down to just 17 percent of their 1975 levels, with Japan consuming 80 percent of the global catch. Here again, activists clash with business interests: prime cuts of bluefin sell for about 14 dollars per piece in upscale restaurants, while an auction in Tokyo this past January saw the record-breaking sale of a single 489-pound bluefin tuna for 1.8 million dollars. The same goes for conservationists who come up against the fantastically profitable mining industry, which is poised to hit 3.59 billion dollars by 2017. Until Japan is able to reconcile these contradictions, environmentalists face a long battle to win concessions and protections for Japan’s endangered wildlife.